This is what stephanie posted on her Facebook page: "This is new FAVORITE TOUR!!! It's a FOOD TOUR! They have several tours and I DID THEM ALL. They have them Saturdays/Tuesdays/Wednesdays/Thursdays and Fridays. NO EXCUSES! 5 TOURS TO CHOOSE FROM. (FIVE!) This is the best way to meet locals/See places there's NO WAY you could otherwise see and get an insiders EDUCATION on what is going on here on Kauai. AND THE FOOD IS THE CHERRY ON TOP. IT'S ALL DELICIOUS! Not to mention the sweetest most knowledgeable guides I HAVE EVER MET ON KAUAI. I am going to scream this tour off my roof top!" Yes, Stephanie tends to get very excited about Kauai activities. I talked to Stephanie about her experience and, after participating in all five food tours, she chose the South Shore Food Tour and the West Shore Food Tour as her favorites. Tasting Kauai offers each food tour in the afternoon; times vary depending on the tour. Foodies drive in their own car (Exception: West Shore is a walking tour) as the guides lead them to places on the tasty treasure map. At each stop someone intimately involved with the food production sets aside special time to talk with, and answer questions from, the group. Because there is a maximum of 14 people on the food tours, participants are given personal attention at each stop. Tasting Kauai calls it a "culinary romp through paradise." What a wonderful way to spend that last day on Kauai before getting on your long flight home in the evening. North Shore Food Tours is a flavorful adventure that explores a diverse selection of handmade food including North Shore grass-fed beef, traditional Hawaiian food, pupus and handcrafted desserts. This culinary romp through paradise introduces guests to farmers, chefs and food artisans during an exclusive, guided tour, which is centered around the regional cuisine of Hawaii, where the host community lives, eats and plays. South Shore Food Tours invites guests to sample the sights, flavors and history of Kauai’s sunny South Shore. The stops are a celebration of food inspired by Hawaii’s multi-cultural population. Experience super fresh Japanese food, local food, and enjoy a private tasting at a fine dining restaurant. This intimate food tour runs every Wednesday and includes six stops featuring the culinary diversity of the Garden Island’s South Shore. East Shore Food Tours - jump in your car and follow us on a culinary adventure across the East Side of the island, known as the Royal Coconut Coast. Explore hidden gems; sample burgers with a local twist and enjoy tastings at some of the East Side’s best farm-to-table restaurants. This unique food tour is centered on the regional cuisine of Hawaii, where the host community lives, eats and plays. This food tour runs every Thursday and includes 6 stops of local restaurants on the Coconut Coast. 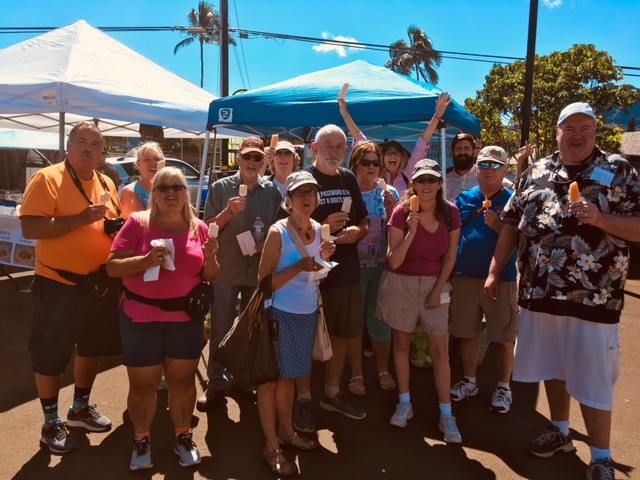 West Shore Food Tours is a walking food tour in the historic hanapepe town. Stroll with us on a culinary adventure of the West side of the island. Explore hidden gems; sample traditional Japanese cuisine with a local twist and enjoy tastings at some of Hanapepe’s most quintessential cafes. This unique food tour is centered on the regional cuisine of Hawaii as well as the subsequent cultures that brought new flavors to the islands. Lihue Farm Food Tours is centered around the farm to table scene of Kauai and on getting behind the scenes in Lihue. You will have a chance to meet farmers and farm to table vendors first hand in the market setting. 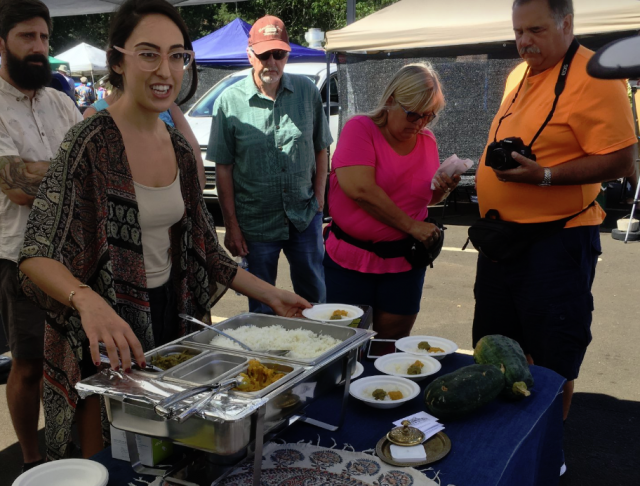 After the farm and farmers market, we will continue our culinary romp through the town of Lihue and get to taste farm to table restaurant cuisine, meet local chefs, visit Kaua’is best brewery… and more. More information about each food tour can be found by clicking the name of the tours above. Tours run rain or shine! $109 per person - 10% off total order when booking online and using the coupon code: ONLINE. Go to Tasting Kauai's website to make a reservation. Registration is open until 9 a.m. the day of the tour. You will receive an email confirmation immediately upon successful registration. Please read it carefully as it includes directions to the first meeting place. If you have not received an email confirmation from Tasting Kauai, check your junk mail. For questions, text/call at 808-278-2912, or email Tasting Kauai at info@tastingkauai.com. For more of my blogs or to subscribe, go to the right hand side of this page (full screen computers). Mahalo!